Dali City, formerly known as Tali, is the county-level seat of the Dali Bai Autonomous Prefecture in northwestern Yunnan. Dali is the seat of Dali Prefecture and includes Dali New City (下关, Xiàguān) and Dali Old Town (古城, Gǔchéng). Dali Old Town is one of the most popular tourist destinations in Yunnan, known for its natural scenery, historical and cultural heritage, and vibrant nightlife. Dali as a centre of the Dali Bai Autonomous Prefecture gathers 25 ethnic minorities to create a unique background with kinds of ancient towns and historical buildings. 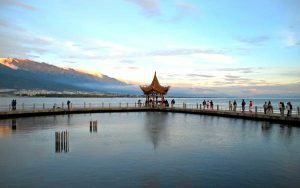 With its geographical location and pleasant weather, there are many top attractions to see in Dali. Cangshan Mountain and Erhai Lake are praised as the city’s leading scenic areas. Most attractions lie between these two landmarks, such as the Butterfly Spring and the Three Pagodas. Also, there are many activities held, like the Spring Fair, Bai Torch Festival, etc. 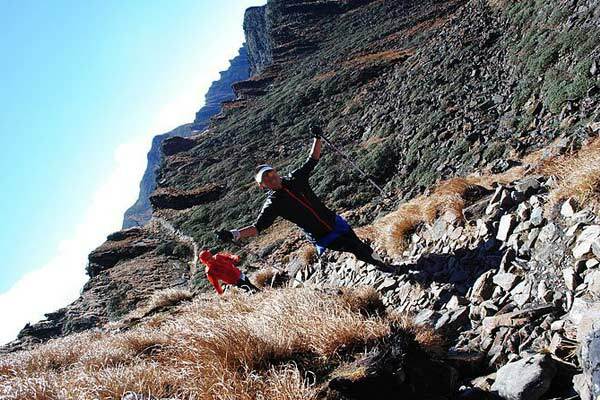 Hiking Cangshan Mountain from West of Dali Old Town is the best way to experience the beauty of this mountain, also the safest way with well-paved roads. It takes only one hour to get the walking trail (named Cloud Pass) where 2 km away from Zhonghe Temple in the north. Along the way, you may see local people doing their morning exercises. Dali is just one of the small ancient towns locates around Erhai Lake. If you are staying in Dali for a few days, don’t forget to grab a bike and explore Erhai Lake region. There are numbers of biking courses you can enjoy: a half day, a full day, or even two full days. Xizhou, a charming small town located 20km northwest from Dali is a good place to visit by bicycle. Xizhou is not the major travellers’ destination, but it’s a good size to spend a day. Seeing the Bai architecture is not to miss in Xizhou. 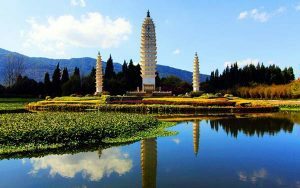 The Three Pagodas, around 3km north of the Dali Old Town, is Dali’s most iconic landmarks, three Layered, cream-coloured pagodas gently tapering towards their summits. The oldest pagoda was built around 850 when the region was a major Buddhist centre. The Three Pagodas look best at a distance. Chongsheng Temple adjoins the Three Pagodas and was the largest monastery in this area.